I’ve had something of a staggering writer’s block during the past 6 months, brought about by a perfect storm of creativity-draining projects and late-night rehearsals, resulting in over a dozen failed attempts at putting anything coherent into already precariously structured sentences, such as this one. Determined to force something out (in the hope of triggering more literary aftershocks) I resolved on the train today to put down three surreal and trivial vignettes from my youth and non-youth (admittedly not really knowing what a vignette is, nor caring to). Vignette No. 1.,): Over 5 years ago I was walking out on King Island, during low tide. I needn’t emphasise that the tide was low, as that is what makes the unremarkable King Island so remarkable; it lies some 800 google-map metres from the mainland off Wellington Point (near Brisbane) (in Australia) and is accessible via a sand-bar for walking purposes only during low tide. During high tide there is no reason to venture thence, as the island consists of 100 square metres of dense mangrove and the decaying, seagull-encrusted remains of anyone who ventured thence while the tide was rising. 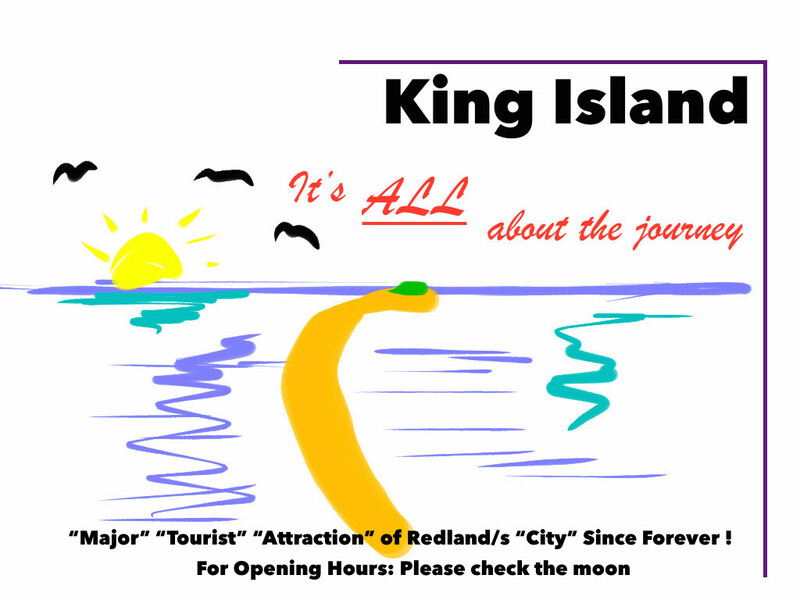 With King Island, it really is all about the journey (see poster below) and not at all about the destination: a pilgrimage to be undertaken purely because of its temporary availability. And if you’re a particularly fortunate pilgrim you might avoid being stung by one of the many washed-up jellyfish. One can only hope that the Bayside Bulletin named it one of the Redlands’ “Major Tourist Attractions” in a valiant effort to hamper the local tourist industry. This occasion became distinguished from my other visits. The sandbar leading to the island extended almost as far past the island as well, so I decided to reach its furthest point. However, after making my way past the main foliage of the “island”, the landscape suddenly became not unlike a Salvador Dali painting; desolate, sandy and littered with hundreds of frozen chickens. * Technically, isn’t all thirst is unquenchable in the long run? This in itself was kind of surreal, as it implies a tree was sinisterly plotting this for some two decades (kind of like a reverse Shawshank Redemption), but there is another story I have regarding it; an experience of near-impalement. One day, hanging upside-down from an (in hindsight) unstable branch for a 13 year-old to be hanging from, I realised perhaps I should probably get down, just as the branch snapped. I fell backwards onto a protruding spike from a vertically-facing branch that had been sawed off. 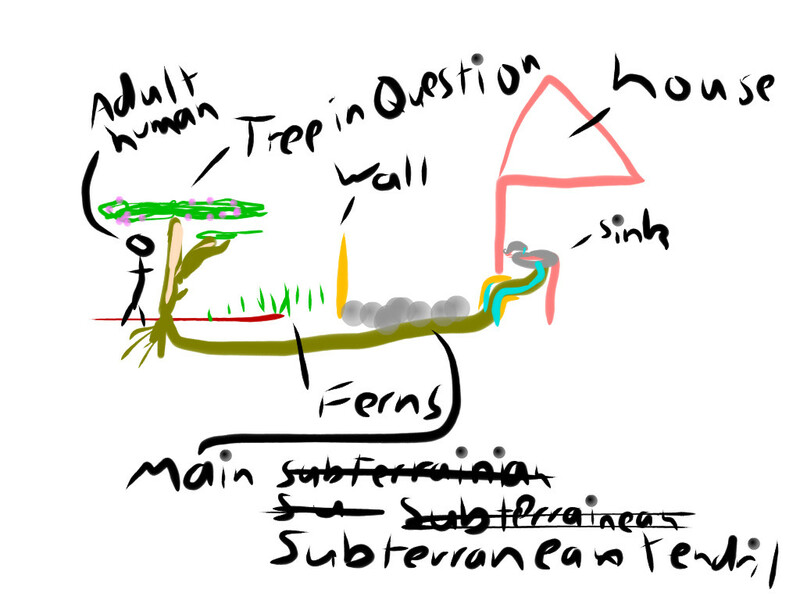 I tried very hard to add this in the Diagram. Fortunately, this spike broke off with my impact, but I ended up unable to move as my shirt was attached to the spike-remainder until a laughing sister freed me, and unable to breathe for a while, apparently from shock. Typical for Australia, recovering on the driveway meant inevitably being bitten by a green ant* **, which was considerably more painful. I ended up with a spectacular bruised gash and after making it assisted to bed, my family ran a bath for me and then went off somewhere. It took a good half hour to crawl unassisted down that hallway to the bath, like some kind of unthreatening zombie in a third rate horror film, but with much more napping involved. * I don’t know if that is the scientific term*** for them, but they had a green shine to them and a very distinctive sting that came with a phycological effect telling you that it was the worst thing ever. ** Helpful Hint: I learnt that if you soaked them in water first they became much more docile and willing residents for your lego houses. I am not sure exactly how I came to make this discovery. *** Wikipedia now tells me that green ant is indeed an acceptable term, although it is also amusingly known as the metallic pony ant. I don’t know how they arrived at that one, but I like it. Vinaigrette Three: While living in Mill Hill, a sunny suburb of London, one of my flat-mates (whose initial meeting of I had managed to avoid for some weeks) happened to arrive home while I was cooking pasta on a gas stove, which of course you should not run away from. She was very friendly and either Dutch or Belgian or some-other-non-UK-and-less-major-European nationality, but extremely friendly and chatty either way. She began a lengthy dialogue at me about how she had just come back from the dentist. I was all ‘oh that’s nice’ and she proceeded to tell me how she had to leave the house at 4am just to get there, all the way on the other side of the city (which, again, was London). It was currently about 4pm or so. “Well that’s certainly dedication” I replied, thinking perhaps she should try and find a closer dentist, but also thinking maybe there was a long sad story involved about how this dentist saved a close relative of hers who had vicious wisdom teeth or something so I did not voice this. I became confused, however, when she then stated how people were lining up around the block just waiting to get in – hundreds of people. I again assumed perhaps it was a very popular clinic (London is very populated after all), one that emphasised quality in a soup-nazi-esque fashion. 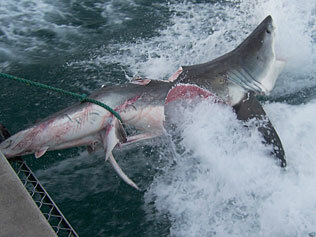 Her closing comments were that she really enjoyed going and planned to go again several times in the next few days. “Good for you!” I thought, smiling and nodding, because I didn’t have any remotely relatable dental experiences. It was not until she had gone and I had finished the pasta that I realised that Wimbledon was on at that time and in all probability she had actually said she had been to the tennis. But I never did verify this – I think it was also my last proper conversation with her. None. I told you they were trivial. 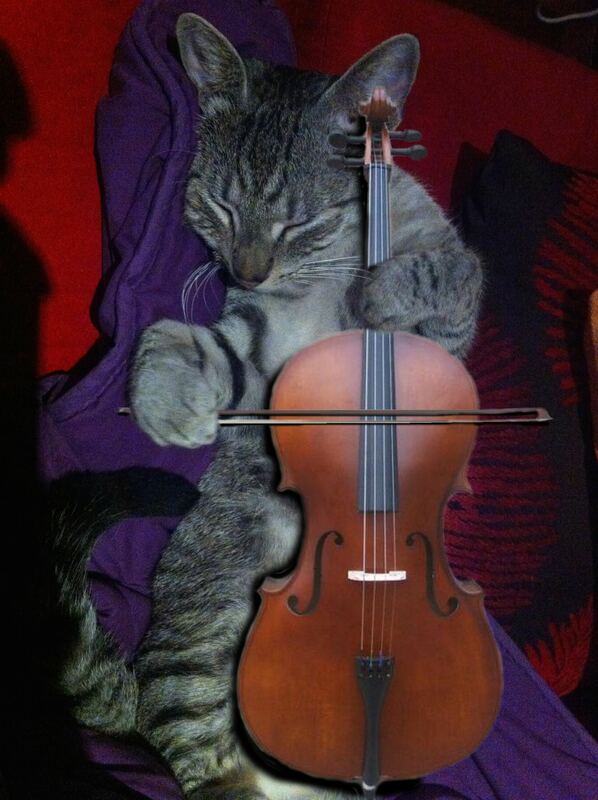 Instead, here’s a photo of a certain (relatively) recently acquired cat playing cello. Much too sul tasto for my taste, but he’s learning.